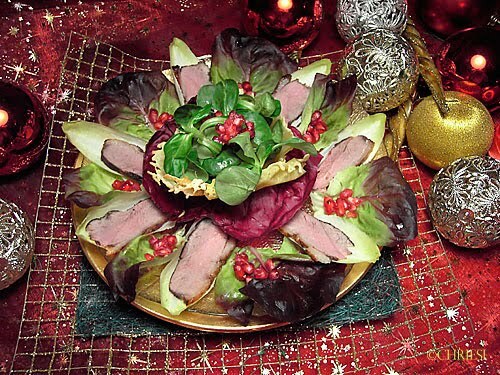 This salad was the first dish at Christmas in our family. It takes quite a lot of preparation but it worth it. I won a Hungarian cooking contest with it. The day before marinate the duck breasts. The side without skin with five spice powder, the skin side with a mixture of white wine vinager and honey. Cut chili and ginger and sprinkle over the skin. Heat a saucepan and fry it on the skin side, then on the other. Preheat oven to 180°C and broil it medium or as you prefer. Heat a saucepan and melt cheese in a circle. When it gets brown take a glass and put the melted cheese over it to form a cheese basket. Clean the pomegranate, save some of the juice for the salat dressing. 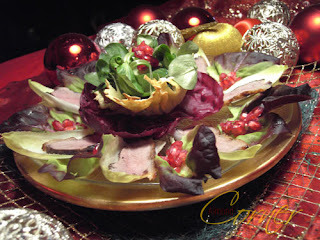 Cut duck breast in thin slices and put each on a chiccoree leaf. Make dressing of the boild eggs, chopped oinion, dijon mustard, red wine vinager, grape seed oil, milk and pomegranate juice. Pour it over the salad and serve.